A breath of fresh air sits in the heart of West Lafayette, IN at the Celery Bog. This 195 acre property gives plenty of space to spread out and enjoy everything this area of the marshy prairie has to offer. The land displays a stunning, 100 acre bog with a 4 mile paved bike trail and a 1.5 mile footpath hugging the view. Waltz through the area with you best puppy friend, go for a bike ride, or just view everything this sweet, city retreat offers at your next visit to the Celery Bog. It’s beautiful covered in snow, spring flowers, summer greenery, and fall leaves. You’ll be glad you came. What’s a bog? According to Webster’s Dictionary: “wet muddy ground too soft to support a heavy body.” All right! Now we know what to expect. The bog area, or wetland, is just that. It’s not accessible to swim or anything, but it’s beautiful to look at! The Celery Bog Nature Area separates into 2 areas: the bog and the prairie. Most of the trail is in the prairie area. Opportunities to see wildlife here is high. Look out for birds such as hawks, squirrels, turtles, and frogs. The Lilly Nature Center sits on the Celery Bog Nature Area property. It’s an informative, interactive resource for anyone and everything. Come on in and learn all there is to know about what the Celery Bog is, what species of animals call it home, what kinds of trees or grasses grow on the property, and more. Coloring pages, classes, and personnel ready to help are available. Stop by to see what it’s all about! Something to note about the Lilly Center is it’s “Wednesdays in the Wild” interactive class. Scheduled classes give detailed information on specific topics. Just look up “Wednesdays in the Wild” on Facebook for more information! Celery Bog Nature Area is open from 8:00 A.M until dusk. 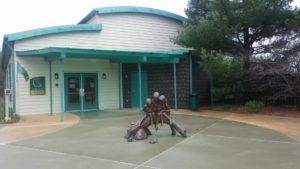 Lilly Nature Center is open Wednesday through Saturday from 10 A.M.until 5 P.M, and Sunday from 1:00 to 5:00 P.M. Closed Mondays and Tuesdays. 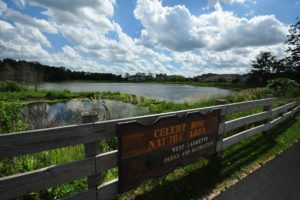 The Celery Bog Nature Area and Lilly Nature Center have the same address. Lilly Nature Center reviews available on Facebook, Google, and Yelp.